Almost every food is better with bacon. As much fun as it is to eat, it is a mess to clean up. The grease coats the whole stove. That does not have to be the case. Today, Chef Alan is sharing with us his tips on cooking the perfect bacon. This is only part one, so be sure to check back for more delicious bacon tips. First, PUT THAT SKILLET DOWN! We will not need that. 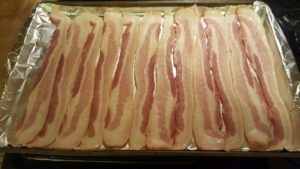 The best and easiest way to cook bacon is in the oven. Preparing it this way will help the bacon cook slowly, more evenly, and because of this, it will not shrink as much as cooking in a pan. Begin by choosing your bacon. A thicker cut will yield the best results but thinly sliced will also work; the following directions are for a thick cut bacon. 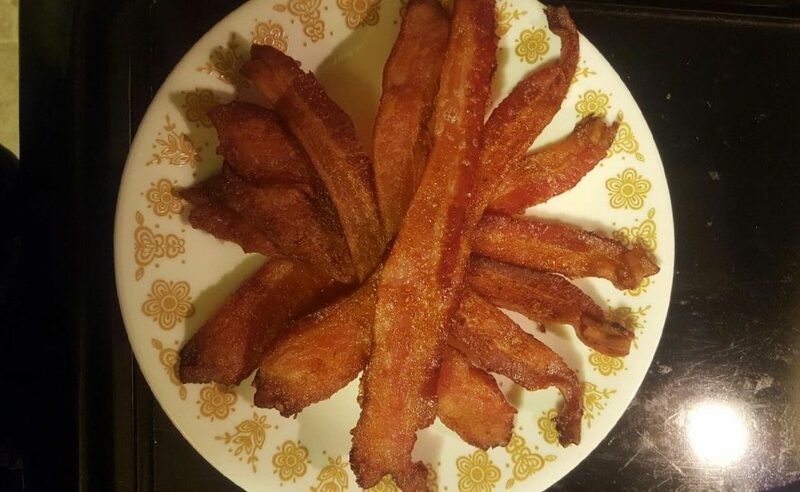 I love our Speedy deli bacon and never cook less than one pound at a time; there are many delicious uses for bacon, but we will get to that later. Line your sheet pan with foil and crimp onto the handles to prevent slipping. Press into the corners and up the long sides of the pan. Taking the time to do this will ensure that all you need to clean up is the tin foil. Starting at one end, place the strips on the pan so that each slice is touching each other. The goal is to create a continuous layer so that it cooks evenly. Place the pan into the oven and bake for 20 minutes. Check the bacon (this will help give you an idea of how long it will take to cook due to the chosen bacon and your particular oven). Cook for 3 minutes more and check again. If using more than one pan, make sure they are rotated at this time to ensure even cooking. Continue cooking 3 minutes and checking until the bacon is almost done. Please do not walk away- we do not want to ruin our tasty treat! Once the bacon is almost done to your liking, take it out of the oven and let sit for 3 – 5 minutes. It will finish cooking due to the residual heat in the pan. If it looks done when you take it out, it will surely end up burnt. Move it to a plate lined with paper towels and layer the paper towels as needed. Now you’re left with two delicious products: bacon, and bacon fat! Check back soon for Chef Alan’s tips on how to use the left over bacon fat! And be sure to pick up bacon (and eggs) at Speedy Market today!